Injera is not only a kind of bread—it’s also an eating utensil. In Ethiopia and Eritrea, this spongy, sour flatbread is used to scoop up meat and vegetable stews. Injera also lines the tray on which the stews are served, soaking up their juices as the meal progresses. When this edible tablecloth is eaten, the meal is officially over. Injera is made with teff, a tiny, round grain that flourishes in the highlands of Ethiopia. While teff is very nutritious, it contains practically no gluten. 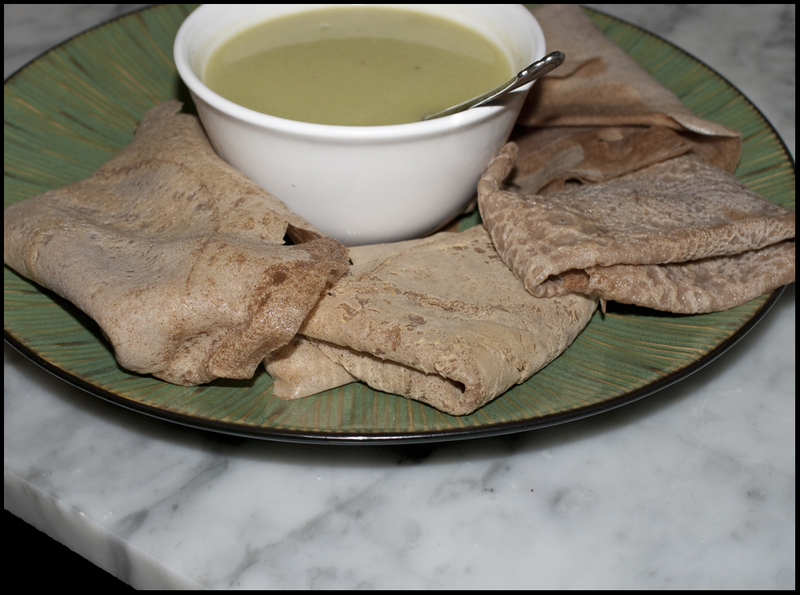 This makes teff ill-suited for making raised bread, however injera still takes advantage of the special properties of yeast. A short period of fermentation gives it an airy, bubbly texture, and also a slightly sour taste. I found an injera recipe on a blog and it sounds quite authentic. It starts with a sourdough starter and uses only teff flour. If you're going to make your own teff starter from a wheat sourdough starter as I did, this recipe is going to take several days. Once you have the starter, it's a three step process to make the injera, and it requires about 8 to 12 hours between each step. So, I guess what I'm trying to say is that this is not a simple recipe, and you need plenty of time to make it. Once your batter is ready, you cook the injera on a hot griddle just as if you were making crepes. This isn't a recipe I plan on making often, but the injera were so good that the time spent to make them was worth it. In the photo I show them with some split pea soup, but we also ate them with a vegetable stew and rice. It's neat to be able to eat without utensils! Here is the recipe; the blogger includes videos on all the steps which I found to be very helpful. It looks fantastic. What an interesting process - I think of flatbread-type recipes to be quick and easy, but this is obviously an exception. This looks like it was worth the effort.